First the reality. Nobody knows what the market is going to do. Yes, I am aware that there are roughly a bazillion people out there “prognosticating” (myself included) about the stock market. And yes, if one makes enough “predictions”, the law of averages dictates that one will be correct a certain percentage of the time. Still, the market does offer clues. Sometimes those clues turn out to be false leads. But sometimes they do offer important information. For example, Figure 1 displays four major market indexes. As you can see, in the Aug-Sep-Oct time frame all four of these averages “broke out” to new all-time highs (i.e., The Good News) and then broke back down below the previous resistance line drawn on each chart (i.e., The Bad News). These tickers appear in Figure 2 (click to enlarge). BID – Broke to a new high in Jun/Jul, then failed badly. In a nutshell, the failed major index breakouts were accompanied by absolutely no positive signs from the 4 bellwethers. So, the warning signs were there if one wished to see them. *There is a chance that 2019 could be surprisingly bullish, and shell-shocked investors should not stick their heads in the sand to the possibility. *Based solely on trend-following indicators ALL of the major market indexes are technically in confirmed bear markets. As a result, there is absolutely nothing wrong with having some portion of one’s capital in defensive positions at the moment (30% cash or short-term bonds?). *Keep a close eye on January performance. A bullish January would be a positive sign just as a negative January could – in this case – signal a continued market decline. *Keep a close eye on the 4 Bellwethers relative to their respective support levels. Those are all the “clues” I can offer at the moment. First things first: I am primarily a trend-follower (this is based on, a) the relative long-term benefits of following trends and b) my lack of ability to actually “predict” anything – but I digress). As a trend-follower I love the fact that the stock market has been trending higher and the fact that there is so much “angst” regarding the “inevitable top.” Still, like a lot of investors I try to spot “early warning signs” whenever possible. Here are the four “things” I am following now for signs of trouble. In Figure 1 you see, a) the blow-off top of 1999-2000 and b) today. Are the two the same? I guess only time will tell. But the point is, I can’t help but think that if and when the bloom comes off of the electronics boom, overall trouble will follow. Here is hoping that I am not as correct here as I was here. As you can see in Figure 2, the Dow Transports has a history of making double tops which is followed by trouble in the broader market. Are we in the process of building another double top? And will trouble follow if we are? Dunno, hence the reason it is on my “Watch List” rather than on my “OH MY GOD SELL EVERYTHING NOW!!!!! List”. Ticker XIV is an ETF that is designed to track inverse the VIX Index. As a refresher, the VIX Index tends to “spike” higher when stocks fall sharply and to decline when stocks are rising and/or relatively quiet. To put it in simpler terms, in a bull market ticker XIV will rise. As you can see in Figure 3 one might argue that XIV has gone “parabolic”. This is a potential warning sign (assuming you agree that the move is parabolic) as a parabolic price move for just about anything is almost invariably followed by, well, let’s just say, “not so pretty”. Let’s hope not. Because if it does qualify as parabolic that’s a very bad sign. This one may or may not be relevant but for what it is worth, Sotheby’s (ticker BID) has on several occasions served as something of a “leading indicator” at stock market tops (for the record it has also given some false signals, so this one is more for perspective purposes rather than actual trading purposes). Still, if this one tops out in conjunction with any or all of the above, it would likely serve as a useful warning sign. There is no “urgent action” to be taken based on any of this. Bottom line: Nothing in this article should trigger you to run for the exits. The summer doldrums may be over, but during periods when the market is range bound, segments within the market are often performing very well or very poorly. One AIQ Report that can show the strength within segments is the Relative Strength Strong – Short Term. This report shows stocks in 3 month trend up and is a great report for those who trade with ‘the trend is your friend’. Here is Friday 9-16-2016 report. The report is ranked by the stocks with the best trend. I highlighted 6 stocks in the top of this report. All have good trends in place, and all in the Oil and Exploration S&P 500 group. The group has performed quite well recently. The top 2 OILEXPO stocks CHK and DVN have both had a small pullback to their uptrend line. We’ll see how they do this week. The basic idea was to see if there were any consistently favorable or unfavorable days of the month. I wasn’t necessarily expecting much given that the stock markets of each of 17 different countries could rightly be expected to “walk to the beat of their own drum”, given that the fundamentals underlying the stock market in any given country may be unique from that of other countries. For what it is worth, the results from 3/25/1996 through 6/20/2016 appear in Figure 1. Each column displays the cumulative % return for each individual single country ETF if we held a long position in that ETF on only that particular trading day of the month. As you can see – and what are the odds of this, I am not even sure how to calculate that – there are 4 days (highlighted in green in Figure 1) that were uniformly “favorable”, i.e., all 17 ETFs showed a net gain on that particular trading day of the month (for the record, there are three trading days – TDM #7 and TDMs -7 and -6 – during which all 17 ETFs showed a net loss (highlighted in yellow in Figure 1. Go figure). *Buy and hold an equally weighted position in all 17 single country ETFs only on TDM 1, 9, 13 and -4 (i.e., if Friday is the last trading day of the month then – barring a holiday – TDM -4 would be the Tuesday of that week), earn annualized interest of 1% per month while out of ETFs. *Versus simply buying and holding all 17 single country ETFs from 3/25/1996 through 6/20/2016. *Why would all 17 single country ETFs all be up (or down) on a particular day of the month over a 20 year period? *If I were considering buying and holding a cross section of individual country ETF’s, um, well, I can’t help but think that I would be haunted by the thought that there might be a better way. Our Chart pattern Recognition tool had a wealth of gasoline related stocks have breakouts yesterday. The classic flag breakout on good volume could be seen on CVX, NFG and TOT. Quick reminder on what a flag pattern is. The flag pattern is considered a continuation pattern after a consolidation period. The flag is a rectangular shape, similar to the pennant, but the pennant looks more like a triangle. Usually there’s a strong price movement followed by sideways price movement which is the flag. The pattern is complete when prices breakout in the same direction as the initial price movement. The following move will be in the same direction as the prior sharp move. The move prior to the flag is called the pole. The flag pattern forms a rectangle with two parallel trendlines that act as support and resistance for the price until the price breaks out. Usually the flag will slope in the opposite direction to the trend. The buy or sell signal occurs when the price breaks through the support or resistance level, with the trend continuing in the same direction as the pole. The breakthrough should occur on heavier volume. I’ve put all three charts together and you can clearly see the pole, flag and breakout. As noted above the volume on the breakout on TOT was reasonable. The Quality of the pattern was also considered high. Incidentally the volume on NFG and CVX was not as significant. The entire list of stocks that generated completed flags in our nightly report on 5/25/16 is below. and check out this new video that shows how we automate this reporting every night using the Chart Pattern recognition plug-in for TradingExpert. Tired of staring at charts time and time again, not certain what is setting up? 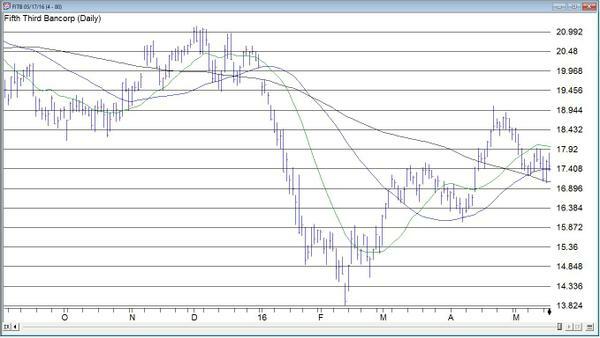 Check out this chart of FITB, Fifth Third Bancorp, How would you have traded this over the last 6 months? What if you had a tool that shows you the exact pattern that’s setup AND includes the direction the breakout is likely to be? 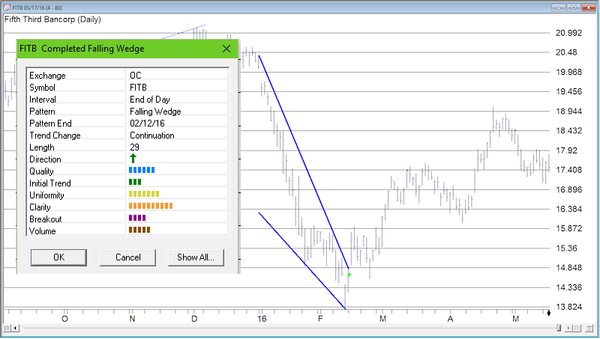 A tool that generates a report every night of chart patterns that have completed and are breaking out. Wouldn’t that simplify your trading? Check out this completed falling wedge pattern from 02/12/16. You would have been alerted to this breakout on 2/12/16, the direction indicator suggested that prices will rise and they did. 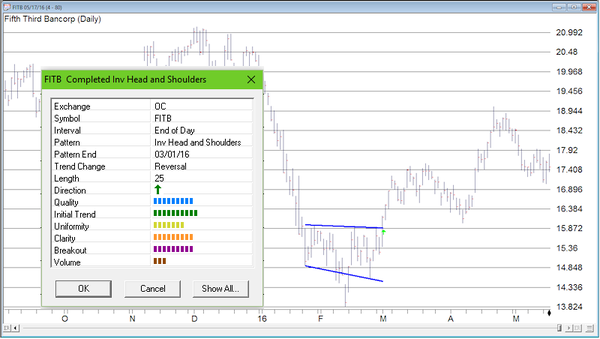 Or this inverse head and shoulders on 3/1/16, the direction indicator suggested prices would rise and they did. and check out this new video that shows the most recent price pattern we were alerted to on FITB on 5/13/16 AND how we automate this reporting every night. The AIQ code based on Ken Calhoun’s article in April 2016 issue of Stock & Commodities Trading Gap Reversals”, is provided below. Save this file to your/wintes32/EDS Strategies folder. Since I mainly work with daily bar strategies, I wanted to test the gap-down concept on a daily bar trading system rather than on one-minute bars. I set up a system that buys after a stock has gapped down at least 10% in the last two days and then trades above the high of the gap-down bar. The entry is then at the close of that bar. For exits, I used the built-in exit, the profit-protect exit set at 80% once profit reaches 3% or more combined with a stop-loss using the low of the gap-down bar and also a time exit set to five bars. I then ran this system on the NASDAQ 100 list of stocks in the EDS backtester over the period 12/31/1999 to 1/11/2016 (Figure 7). The system generated 303 trades with an average profit of 1.09% per trade with a reward-to-risk ratio of 1.35. Slippage and commissions have not been deducted from these results. FIGURE 7: AIQ. This shows the EDS test results for the example system. Again, the code and EDS file can be downloaded from www.TradersEdgeSystems.com/traderstips.htm, and is also shown below. GapD is (O / C1 - 1) * 100. SU if  scanany(GapD < -GapSize,GapLookBack). SU1 if  scanany(GapD < -GapSize,GapLookBack,1). SU2 if  scanany(GapD < -GapSize,GapLookBack,2). List  if C > 0.